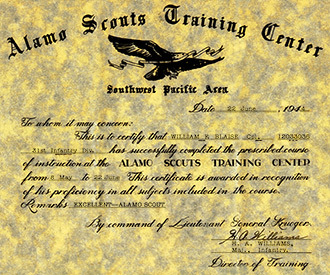 On 21 November 1943, LTG Walter Krueger selected LTC Frederick W. Bradshaw, a brilliant attorney from Jackson, Mississippi, to establish an Alamo Scouts Training Center (ASTC) that would combine the best training elements from other elite services with specific skills needed in the jungles and on the beaches of the Southwest Pacific. 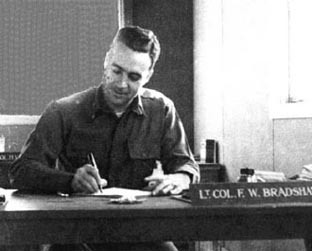 Under Bradshaw's command, the ASTC would produce well-trained, highly-motivated, six-to-seven-man teams that could infiltrate behind enemy lines, gather information, and get out undetected. 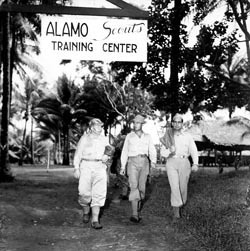 In addition to producing trained Alamo Scouts, the ASTC was used as a base of operations for operational teams. 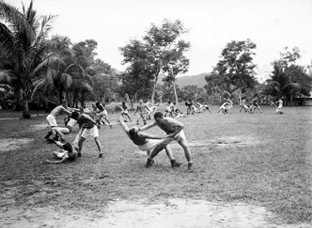 Alamo Scout candidates practice hand-to-hand combat at the ASTC. Fergusson Island, New Guinea. January 1944. 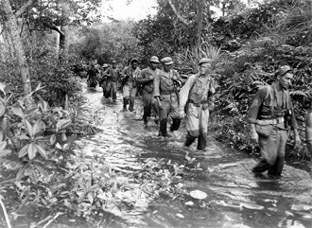 Alamo Scout candidates on a 26-mile jungle hike. 1944. Signal Corps Photo. 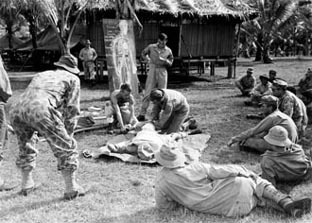 Alamo Scout candidates receive advanced jungle first aid training under the watchful eye of Lt. Col. Frederick Bradshaw (foreground) and Dr. Richard Canfield (standing in background). Fergusson Island, New Guinea. 1944. Candidates practice water survival skills with full equipment. Fergusson Island, New Guinea. (1944) Signal Corps Photo. 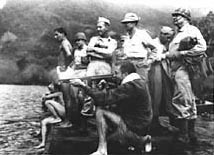 Alamo Scout staff fires in the water at a trainee during water training while Lt. Col. Bradshaw (hands on hips) and Major General Innis Swift (wearing helmet) observe. 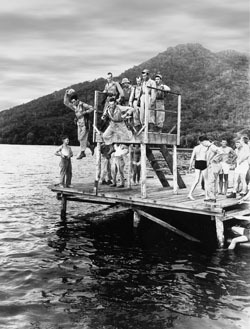 Fergusson Island, New Guinea. January 1944. Signal Corps Photo.